Feelings of loneliness, abandonment, isolation and depression often accompany a move from home to a residence for the elderly. These same feelings can also be experienced by "shut-ins" no longer able to worship in the church they have served faithfully for years. Often, a visit from church members and the chance to take part in worship where they are located, can make all the difference. Yet many - both clergy and laity - may find it difficult to make a home visit or to approach a long-term care facility. In response, the Trinity Congregational Church of Fitchburg expanded its Nurture and Fellowship Committee beyond the church walls, incorporating several other churches - including Bethany Lutheran in Auburn, as well as First Congregational and United Congregational in Worcester -- and agencies of the Central Association to form the Task Force on the Spiritual Care of the Elderly. Task force members provide worship services for individuals in nursing homes, assisted living residences and rehabilitation centers. The group works to help a congregation meet the spiritual needs of its own elderly members through educational workshops, which are designed for clergy and laity, young and old, members of the diaconate and of the larger church family as well. These workshops are based on the book by Rev. Dianne C. Dugan, Spiritually Caring for Frail Elders and Their Families. One of our residents found the worship service so meaningful that she asked the Activities Director if the number of services could be increased from once a month to weekly. This resulted in the Task Force providing two services a month and being paid an honorarium as well. This same resident takes the initiative to invite others she thinks would enjoy the services. Not only does this enhance the spiritual life of individual worshipers and the community as a whole, but it also points to the need for more leaders of worship services to provide weekly services. 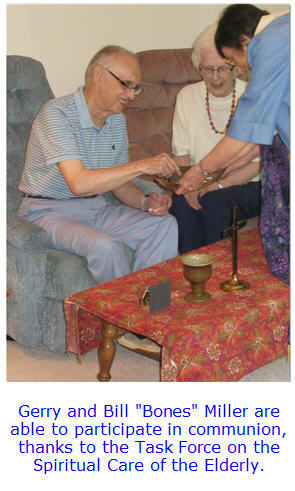 The spiritual care of the elderly is part of the mission of the church. Yet our survey revealed many have been neglected once they moved to a residence for the elderly. Now is the time for the church to come to them; it is a matter of justice that they be included in the mission of the church. For more information, e-mail EldercareSpirit@hotmail.com or phone Rev. Jo-an J. Bott at 508-755-8207. This effort has been endorsed by the Massachusetts Conference Commission for Mission and Justice Ministries.